Liversedge's Rhys Davies looks to take on an Eccleshill defender in Saturday's derby. Liversedge were hit for six in a nightmare derby display at home to Eccleshill United last Saturday. Defeat leaves the Clayborners 16th in the Northern Counties East League Premier Division table, five points above the relegation zone, ahead of crucial games against bottom side Goole on Saturday and 17th placed local rivals Thackley, who they host on December 15. 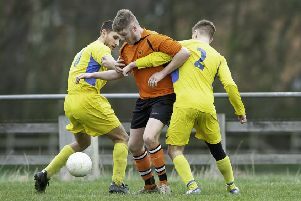 Liversedge were 3-0 down at half-time and conceded a further three goals in the final six minutes of last week’s contest as they slipped to a 12th defeat of the season. Eccleshill led after just six minutes when a corner from the right was worked to Thompson and he sent over a cross for Aran Basi to rise unchallenged and powerfully head home. Liversedge were denied an equaliser when their former goalkeeper Harry Stead saved a diving header at point blank range. Eccleshill doubled their lead when a superb curling shot from 30 yards out by Khurram Shazad lopped over the Sedge goalkeeper into the top corner. A brilliant run by Adam Shaw saw him evade a tackle and draw the home goalkeeper before laying the ball off for Charlie Flaherty to tap home. Liversedge kept their opponents at bay for long periods of the second half before a late flurry of goals completed Eccleshill’s emphatic win. A trip on Rose, just inside the penalty area, gave Shaw the chance to confidently convert an 84th minute spot kick. Shaw then drilled home from the edge of the area after Eccleshill had worked the ball downfield. Liversedge’s misery was completed in injury time when substitute Christopher Lever tapped home Rose’s neat pass.